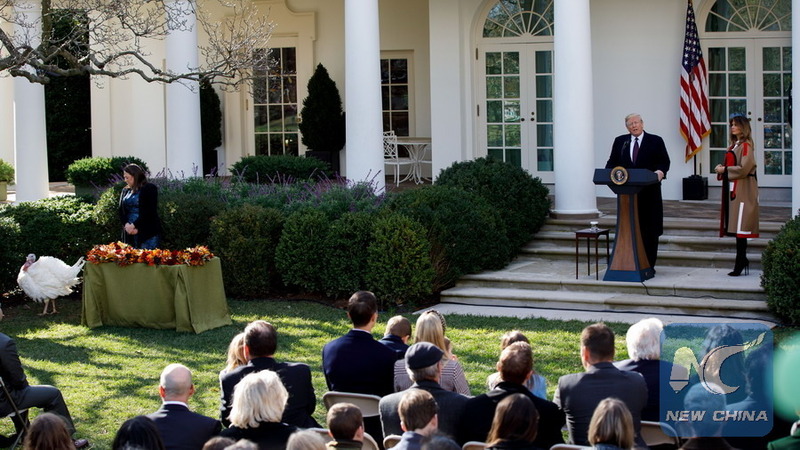 WASHINGTON, Nov. 20 (Xinhua) -- U.S. President Donald Trump on Tuesday pardoned two turkeys, namely "Peas" and "Carrots", in an annual White House tradition for the coming Thanksgiving holidays. "That turkey is so lucky. I've never seen such a beautiful turkey," Trump said of Peas. "Unfortunately, Carrots refused to concede, and called for a recount," the president joked, referring to the vote recounting of Florida gubernatorial and Senate races last week. Peas and Carrots arrived in Washington, D.C., on Sunday from South Dakota, where they were raised, according to local media reports. They will spend retirement at a farm in southwestern Virginia after being pardoned. Local media said rumors of turkey pardons go back as far as the Lincoln administration, when the president's young son supposedly begged his father to spare a pet turkey that was destined for the dinner table. However, the first documented turkey pardon was given by President John F. Kennedy in 1963 and it was in 1989 that President George H.W. Bush started formal pardons what became a tradition upheld by every president since, said local media.